I’ll bet this sounds familiar. Your child learns that they can handle difficult feelings without avoiding or stuffing them. You and your child strengthen your connection. Your child feels valued, worthy and accepted even when experiencing difficult emotions. Here are 2 strategies and 1 rule to help you guide your child through difficult feelings such as fear, disappointment, and frustration. You can help to shift your child’s perspective by teaching them feelings are like waves in the ocean. There are big ones, little ones, fun ones to play in and not so fun ones that crash over you. There is always another wave coming. Feelings are always changing and shifting. Then give your child some examples of how they might feel throughout the day such as he or she might feel excited when playing Minecraft or he or she might feel proud after drawing a picture of a cat-icorn (in case you haven’t heard, this mythical creature is a cross between a cat and a unicorn). This strategy is important because it teaches your child that feelings come and go. It fosters resiliency and emotional self-regulation. Listen to the feelings in the story not the facts. Ask your child what is happening for them and then listen to their story with the goal of identifying the feelings expressed in their story. No need to point out inaccuracies, illogical points, or try to convince your child why his or her perspective is wrong. This strategy is important because it teaches your child that they can feel their feelings. They can sit with them until they go away and they can tolerate them without avoiding or stuffing. It also shows them that you will be there to support them with difficult or painful emotions. In these moments, when your child is struggling and in emotional pain, you probably want to ease their suffering; you want to make her or him feel better and you want to do it as fast as possible. Distracting is when you suggest other more pleasant activities for your child to engage in and avoid dealing with the emotions that have been triggered. It often occurs when parents themselves struggle with tolerating their child’s distress. This shuts down your child’s expression and experience of difficult emotions creating the unhealthy coping strategies of stuffing and avoiding. Discounting is when parents minimize or try to talk their child out of their feelings. The philosophy behind this is that if you can logically explain to your child why her or his feelings are wrong, she or he will feel better. In reality, the message your child hears is you are wrong, your feelings are wrong, and you’re not good enough because you’re having these feelings, so stop. Following this rule is essential because your child will know and feel that you are empathizing with his or her feelings and will no longer feel you are dismissing their emotions. Using the techniques of Feelings are like waves and Listen to the feelings in the story not the facts will support your child in feeling heard and not dismissed. Eliminating distraction and discounting will support your child in tolerating their uncomfortable emotions. Oh gosh! This is so lovely – so spot on for me. My sweet 8 year old boy has been going through the 9 year change and the emotions – wow! This is SOOOO helpful! Thank you for the excellent reminders and the practical steps! The 9 year old change… I hear you! Glad you found the ideas helpful. Oh my, your two strategies and one rule are so important in raising well-adjusted kids. I’m beginning to think that teaching our kids how to self-regulate should be stressed more in parent education…especially for intense, fiery kids. I so agree. The parents I work with absolutely love having tips and techniques to support their kids with emotional regulation. What a great article Kim! I am a mother of two little ones, and I just love the analogy; feelings are like waves as well as the second technique, and 1 rule. Great information for parents to help their kids feel heard, honoured and be emotionally intelligent and resilient. Thank you! Wow, I have never thought of the negative effects of distracting a child when they are having uncomfortable feelings. That is such a great point that it is helping them turn to other things to make them feel happy instead of face their uncomfortable feeling and deal with it head on. Thanks for the tips I appreciate them. Glad you found the article helpful! I’d love to know how the tips work out for you. So true! Thank you for the waves illustration. Its a good one for kids at a level they can understand. Being with my child when she has negative emotions instead of trying to change them is not always easy (as it triggers my inner peace). But it lets her see that I love her n matter what she is feeling. I used to try so hard to get her to be more positive. I didn’t want her to suffer what she didn’t need to suffer. But I was denying her the right to her emotions. So many parents tell me that they just don’t want their kids to suffer. It can be hard to tolerate our kids uncomfortable and intense emotions, but the rewards of teaching them to tolerate suffering far outweigh those of teaching them to avoid it. This is such brilliant information. I always try to listen and sympathise when my three year old is feeling sad or angry. I think it’s important to let children know that it’s ok to feel sad or angry etc, it’s all part of being human and that’s why I particularly agree with the third point, don’t distract or discount. Emotions are healthy and normal, even though they sometimes don’t make us feel the best, they are all equally important. Glad you found it helpful, Linda! Kim this is great advice! I see this format being gr8 for healthy adult relationships too. Well said. Thank you! I definitely use these techniques regularly. I love the idea of feelings being like waves…it helps a lot to put the feelings in perspective, and remain empathetic at the same time. I’m so glad that resonated with you. Very good article, love the picture. I need to send this to my daughter so she can better deal with alpha personality grandson. LOL, blessings. Thanks for forwarding to your daughter. Hope she enjoys it! What a great article for supporting parents and their children. Well done! I love to idea of telling them that the emotions are like waves, and to listen to their story to find out what emotions they are feeling and address that! This is an incredibly important article. My unreasonable fears were shrugged off when I was a child. If my mother had actually listened and discussed my fears, perhaps the story of my abuse would have been discovered before I became an adult. Thank you for an important message for parents and grandparents. Thank you for your support. Your story empowers others. It can be hard in the moment to gather the energy and be present. 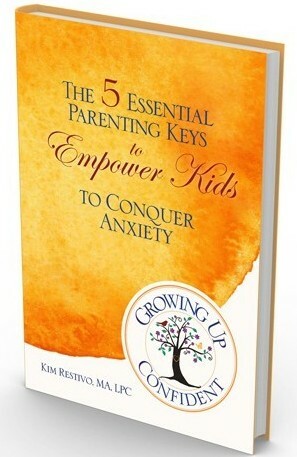 The first key in my free eBook, “The 5 Essential Parenting Keys to Empower Kids to Conquer Anxiety”, is full of techniques to help parents stay present. Check it out. Great advice Kim, and advice that I will implement further (I’m currently working on not teaching them to comfort eat by handing over a sweet every time they’re hurt). I do make a point of trying to pinpoint the underlaying feeling but I’m not that hot, I guess I’ll get better with practice. Let me know how the techniques work for you and your kids. What a wonderful, insightful post, Kim! Every parent in the world should see this. We have to acknowledge how kids feel to valadate them. I like how you set the steps out in the bright numbers, and totally love that photo of the little girl. Thanks for a terrific post. Thank you for your kind words, Neld. I’d love to learn more about this! My 3 year old gets so angry when I don’t understand what he’s trying to talk to me. I feel his frustration but don’t know how to help him!